Perform ADDITIONAL SERVICE WHEN REPLACING ECM. Refer to EC-135, "Work Procedure". Disconnect ECM harness connectors. Refer to PG-42, "Description". 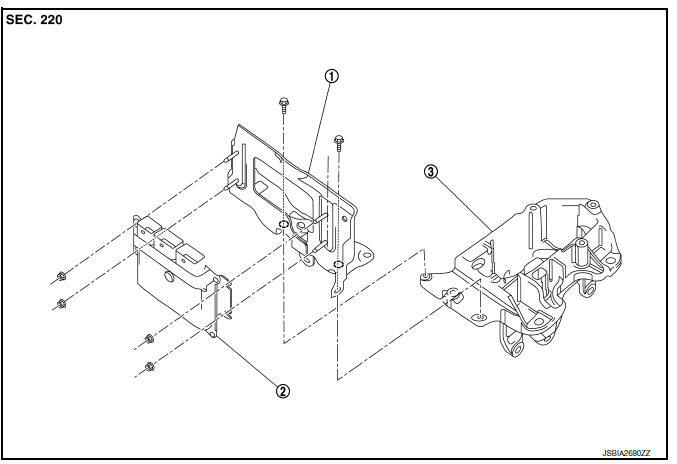 Remove the fuse box bracket from the ECM bracket. Remove the ECM bracket from the engine mounting LH, together with ECM. Remove ECM mounting nuts, and then remove ECM.